Cooking the traditional Thanksgiving turkey doesn't have to be hard, just use this fun and cool new Terrific Turkey Timer. 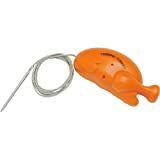 This unique turkey timer and thermometer makes it simple to cook a holiday bird to perfection. 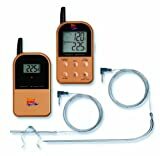 Simply slide the stainless steel probe into the turkey, place the device on the counter and when the internal temperature reaches 165° F it flashes a light and sounds a gobbling alarm. Unlike a boring old pop-up turkey timer, this one doesn't require you to keep opening and closing the oven door to check on it. 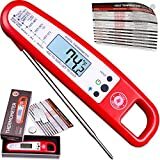 Instant Read Meat Thermometer For Cooking And Grill.